Use Your Time Wisely — You Don't Have As Much of It As You Think! 1. Recognize time is a finite resource and plan accordingly. Create a time allocation plan for yourself and your team this morning to use your limited capacity wisely for the next 90 days. Include target percentages for making decisions, motivating people, addressing issues, assessing goal achievement, and engaging customers. As with any budget, ruthlessly prioritize so the time you plan to spend isn’t greater than the time you actually have — if it’s not in the budget, delegate it or drop it. 2. Align time used directly to goal achievement. Be as systematic aligning time to goal achievement week over week as you are setting goals at the start of the year and measuring performance at the end. Chasing status reactively and consuming time on work that doesn’t contribute to goals waste precious time. Define 1-3 streams of work that support achievement of each goal, and ask your team to do a short weekly report on action item progression by stream. Put the goals and streams into the report template to ensure week over week linkage between the team’s work, everyone’s time and your business goals. 3. Take some time to experience gratitude. Complement more intentional use of time and better time-goal alignment with 10 minutes a day to identify and acknowledge great work or effort – ideally the 10 minutes before you leave the office. It’s renewing and energizing for you and others. This habit will strengthen your empathy skills and remind others why they’re investing their time to help achieve your business goals! Put these practices to work this week to increase your productivity and satisfaction; join the conversation on this and other topics to share what works best for you. Until next Monday, have a great week! P.S. Consider using WorkBoard for easy, effective status reporting. You define goals and workstreams, your team tracks action items by stream and reports from their list; WorkBoard automatically distills their reports so you know how to focus your time and theirs. 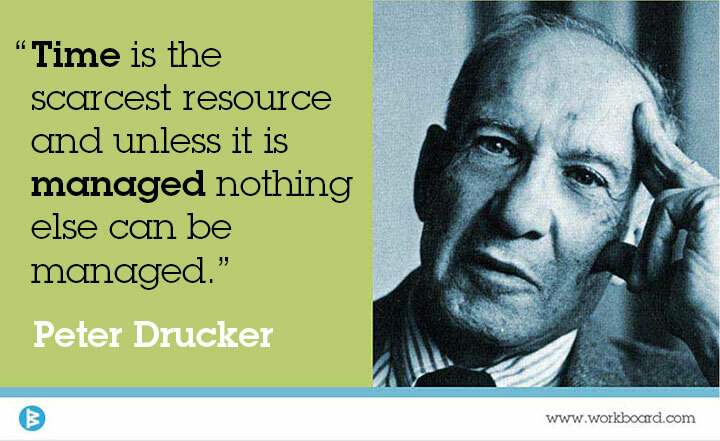 Peter Drucker was brilliant, humble and accessible. He graced the cover of Wired at 82 and wrote 41 books on management published in 37 languages. World and business leaders from Kennedy to Buffet to the Emperor of Japan sought his counsel. We were honored to have known him. Our favorite Drucker work is Management: Tasks, Responsibilities, Practices.